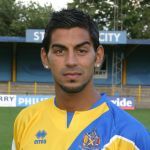 Midfielder who played a significant part in St Albans Citys promotion to the Conference National in 2005-06 after returning to the club for a second spell having spent half a season with Dagenham & Redbridge. Norwegian-born he has represented Norway at Youth level and since leaving his home country has, in addition to playing in England, played football in Australia. Joined City from Grays Athletic in September 2004 having previously played for Erith & Belvedere and Ilford, has also had trials with Leyton Orient. Joined Hayes & Yeading United on loan early in 2007-08, making the move permanent after the New Year. Returned to the Saints in September 2013.